Because of thick post-impact sediments in the inner part of the Azuara structure, the find of shatter cones is restricted to the sediments of the rim zone. In this zone, the shock wave was already weakened to the lower pressure limit of shatter-cone formation. 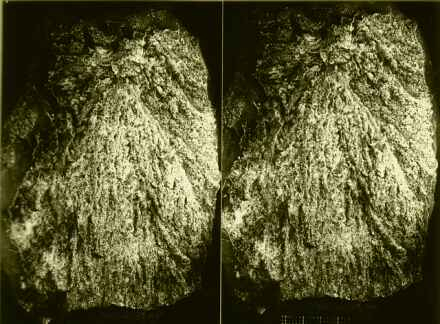 Consequently, it is not surprising that shatter cones are rarely found and that the fracture cones often display only diffuse horsetail structures. Fig. 1. Shatter cones from the Azuara impact structure (Spain); Jurassic limestone. 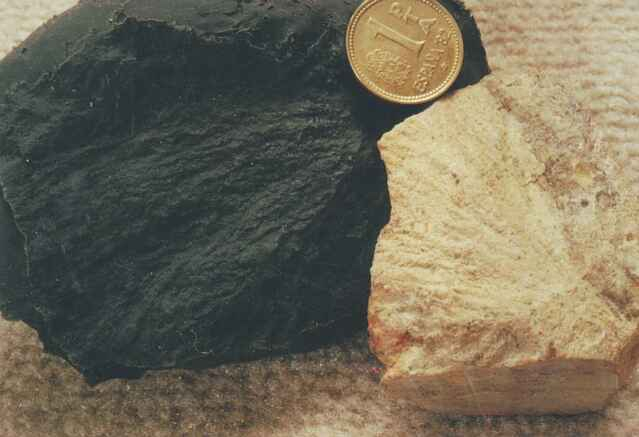 The black specimen is a silicon cast of a shatter cone negative. Fig. 3. Shatter cone in a Jurassic limestone, Azuara impact structure. Photographs (Figs. 3, 4) by courtesy of H. Müller. Fig. 4. Rear side of the sample in Fig. 3 displaying more shatter cone fracturing. 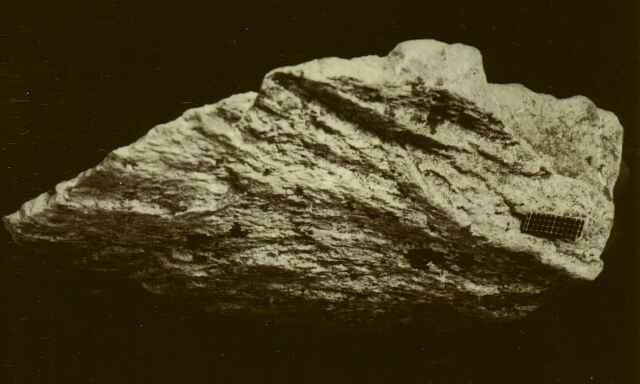 Fig.5. Stereo image of a shatter cone in Jurassic limestone, Azuara impact structure. Photograph by courtesy of G. Mayer. Fig. 6. Moderate shatter cones in Jurassic limestones; near Muniesa, Azuara impact structure. Photo: M.R. Rampino. 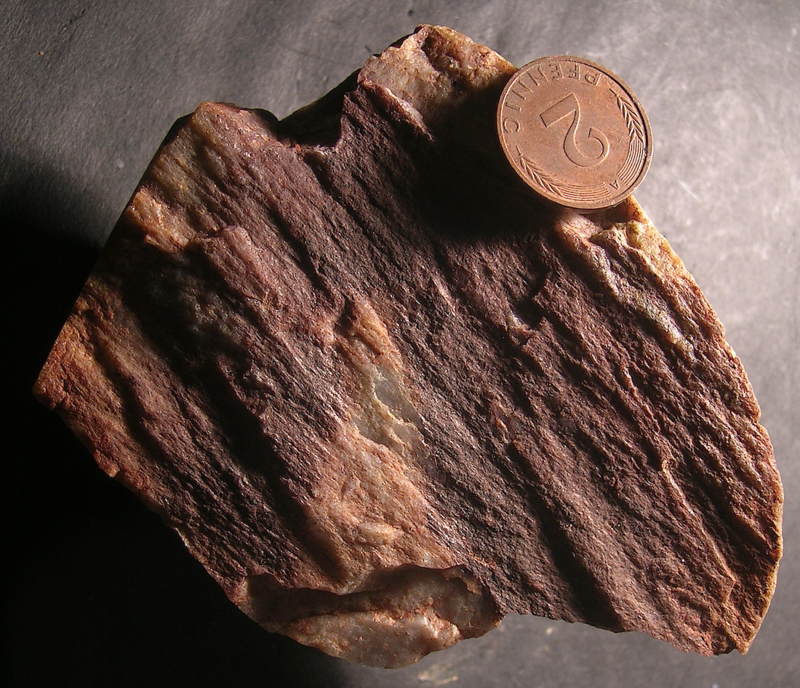 Although in the Rubielos de la Cérida impact basin competent rocks are widespread and especially exposed in the central-uplift chain, only very few shatter cones have been found so far. This is believed to be mainly due to limited outcrop conditions (freshly exposed rocks are rare) and to the lack of a detailed mapping. Fig. 7. Shatter coning of rather moderate quality in the Rubielos de la Cérida impact basin; Jurassic limestone in the central-uplift chain. Fig. 8. Shatter cone displaying only diffuse horsetail markings. Rubielos de la Cérida impact structure; Jurassic limestone in the central-uplift chain. Fig. 9. Shatter cones in Cambrian siltstones; near Olalla at the northern basin rim. 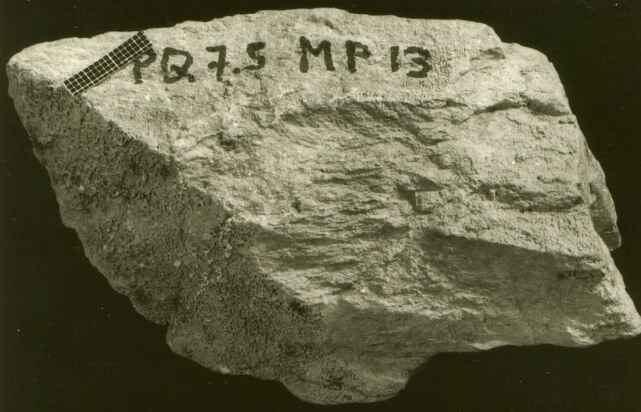 Note the conical fracture surface and the typical horse-tail fracture markings. 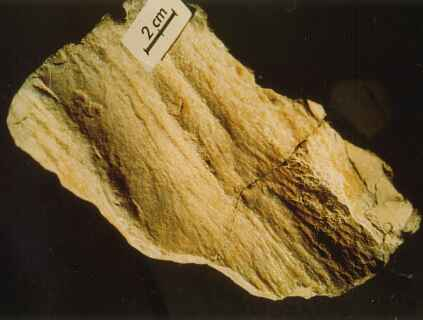 The joint surface in the base displays faint plumose fracture markings not to be confused with shatter cones. Sample from collection P. Bockstaller. Fig. 10. More shatter cones in Cambrian siltstones. 10 cm scale bar. Fig. 11. 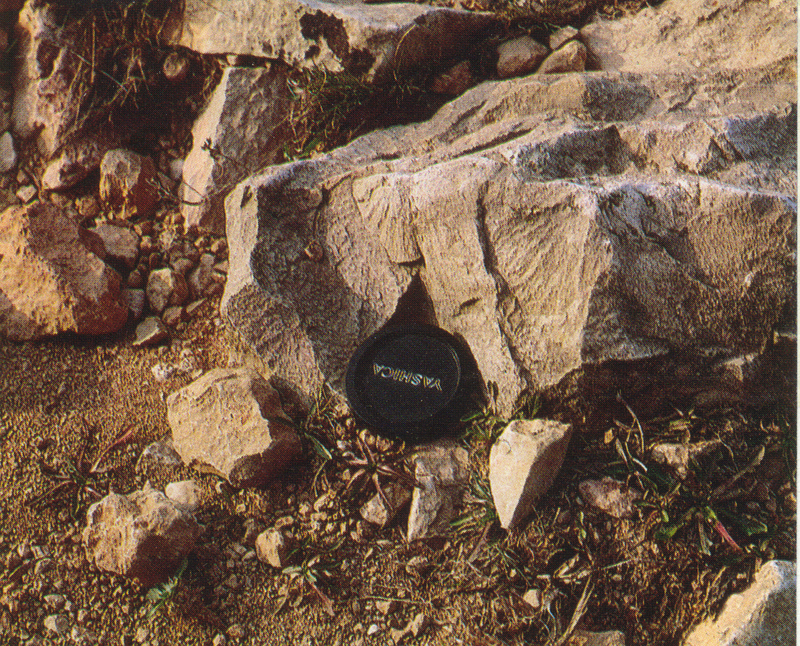 Shatter cleavage in quartzite, Azuara/Rubielos de la Cérida impacts, Spain. Few horsetail markings have developed more or less in a fracture plane inside a shocked Buntsandstein quartzite cobble; near Molina de Aragón. Sample by courtesy of P. Bockstaller.